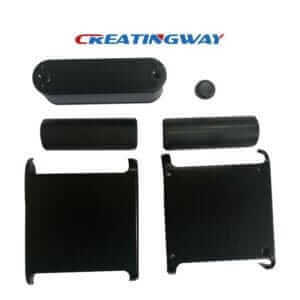 Creatingway offers more electronic metal shell prototype from prototype making, trail order till low-volume production, we own more advantages CNC machine centers and milling machines to services your projects, and our professional engineer team are closely work with you for your projects in order to ensure each of details meet requirement, we have been worked much more electronic products shell to our customers for assemble. The metal shell feature is too depth, and the thickness is 1.2mm in order to keep top/bottom shell assemble, we have to make precision machining with 4 axis CNC machining center, and using 1mm to machining four small corners. Two side body material is black ABS to matching whole metal shell in order to make whole electronic shell. After most of electronic metal shell prototype machining, we will provide good finishing like anodizing, power coating and silk-screen. These electronic metal shell need to make them high precision and fitting with inside components like PCB etc, so it ask us to keep good quality control under high standard. As usual, the electronic metal shell ask high standard appearance and aesthetic , we must make these parts with finishing like polishing, anodizing etc. We have to make good packaging for each of parts protect scratching. Customer’s feedback for our metal shell prototype machining.